I’m usually compelled to blog about a sequence I’ve carefully constructed—one I’ve thought about in depth, struggled with, and streamlined. But today I’ll look at a sequence that wasn’t planned at all. This is because I’ve located an underexplored area in my own pedagogy: the happy accident. Not that my teaching is particularly accidental: on a scale from haphazard to organized, I’d say I’m pretty organized. But on occasion I encounter someone superorganized. And I marvel, because the superorganized are impressive and humbling. On the other hand, teaching a course that is fairly organized—a couple notches down from extraordinary and a bit shy of superorganized—has its perks: sometimes I discover a gem… a happy accident. Where I hadn’t envisioned a clear transition between lessons, now I discover they are not only connected, but that one is actually integral to another. As if I had planned it (which, technically, I did). This happened recently in my introductory course on the creative nonfiction essay. With a cluster of weekly topics planned for the first half of the semester, I wasn’t particularlyworried about how those topics would build: I envisioned an inventory of basic tools. This would give students the necessary foundation for an outside research progression and an ekphrastic writing project during weeks 7-15 of the course. I paid more attention to the strategic arrangement of the second half of the semester. But sparks are flying between two topics early on: Writing the Family and Place as Character. It looks like studying family gives students (particularly students who are learning to read like writers) a foundation for place. Why didn’t I think of this myself? Students of the novel learn, for example, that Balzac’s lush descriptions of a drawing room simultaneously function as a sophisticated socioeconomic study of nineteenth-century France while also situating his characters in precise positions within that stratified society. 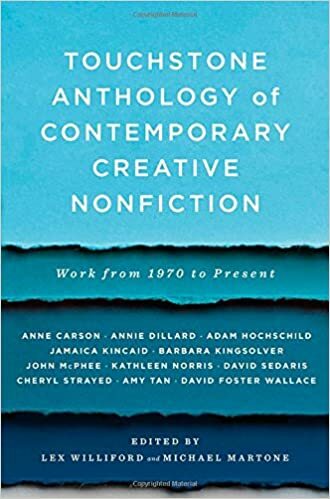 Setting in contemporary creative nonfiction essays work the same way; the key is to get students invested in understanding the work that a description of setting or a passage about place is doing in the essay as a whole. I notice that even if students overall don’t tend to harbor curiosity about place writing, they are concerned about the ethics of nonfiction family writing. In general, they don’t want their own writing to sell anyone out or burn bridges—many are living on their own for the first time and miss their families more than they expected to. Learning to read like writers in this context means, among other things, learning to find the sweet spot where compassion, respect, and honesty all coexist on the page. David Sedaris’ essay centers on his sister, Lisa. After gathering reader responses in a few minutes of personal reaction-based discussion, I introduce the term “characterization” with a very open-ended definition. Characterization is any passage or element of the text that reveals one or more of the following: personality, mood, inclinations, preferences, history, desires, motivation, conflicts, gestures, the body, the mind, the spirit. We take a few more minutes for open-ended discussion in which students interact with this definition and the text. Then, I have students work individually. They create a two-column table and select the three passages they consider to be “most revelatory about Lisa” for the left column. All essays named in this post appear in this anthology. Once this column is filled out, I introduce the heading for the right-hand column: “what exactly the passage reveals about Lisa.” Students work individually to get initial ideas down, then we open up the activity for collaborative analysis. round of class discussion becomes, for one student working individually, a passage that reveals Lisa’s guarded sense of lurking danger. When that student shares this insight in the second round of discussion, others chime in. They agree line reveals Lisa’s wariness, but it’s still funny. Why? Well, it also reveals the narrator’s perspective on Lisa (it reveals that Sedaris finds Lisa both charming and overly reactive, giving us a window not only into Lisa but to the sister-brother dynamic). We repeat this with other passages students have chosen, and find a repeating pattern: powerful characterization often tells us more than one thing about a character. revelations prepares beginning students to approach setting and place as an assemblage of meaningful revelations as well. For example, the discussion question, “what does detail XYZ reveal about the character?” is valuable beyond family writing because it demands that students make the same mental moves they need to make in order to parse a text’s construction of place. For example, Diane Glancy’s essay, “Sun Dance” involves “the low, rolling hills of South Dakota under the sky that lidded them.” The same close reading approach we took to Sedaris’ essay will reveal a degree complexity and importance in Glancy’s treatment of place very similar to what students found in Sedaris’ treatment of his sister. The experience reminds me, as a teacher, of the importance of audience: I can probably never know my students well enough. This places a very particular kind of pressure on my pedagogy—it comes in large part from my academic training, but it also depends on continually ethnographic observation of the student population I’m immersed in. With every window I get into their lifeways (happily accidental or otherwise), it becomes possible to understand their learning more clearly, and—I hope—to teach them a little better.